When I fell pregnant I quickly learnt that I am a bit of a bargain hunter. I would often scour Facebook pages for baby bargains and always want to buy things we don’t need because it’s good value! So I get a little carried away when it comes to baby clothes and sales. 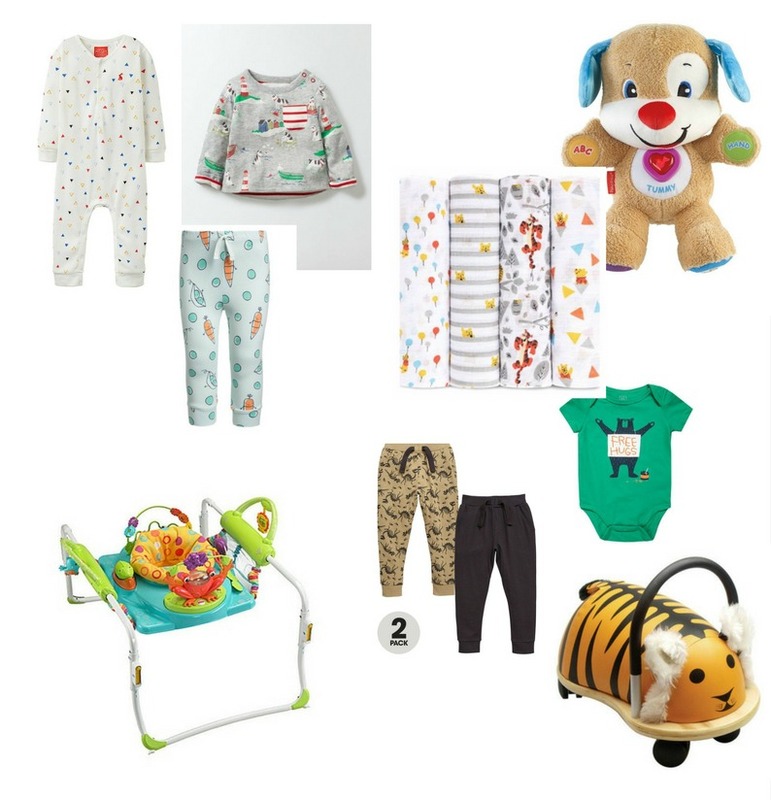 I put together this wishlist via Love The Sales which was a great shopping experience as it brings all of the sales to one place! Joules Babygrow. I love these little 80s vibes prints and Joules items are such fantastic quality! Click Here to Buy. Boden Top. Let’s face it, Boden don’t often get things wrong and this top is just far to cute! Click Here to Buy. Winnie the Pooh Muslins. Be still my beating heart! I am a bit of a Winnie the Pooh fan, I loved it as a kid (Rory isn’t quite there yet) and Aden & Anais muslins are my absolute favourite! Click Here to Buy. Fisher Price Puppy. Rory has a talking puppy from this set that he got with his activity mat that he is obsessed with, he is getting more and more into interactive toys so I am keeping my eyes peeled for good ones at the moment! Click Here to Buy. Free Hugs Bodysuit. I am going to advertise his hugs whilst they are still free! Click Here to Buy. Carrot & Pea Joggers. Click Here to Buy. Fisher Price Step & Play Jumperoo. Right – why have I never seen this before? We are the biggest Jumperoo fans in this house, we have two, and we also have a walker which is a lot of stuff to store. How have I never seen this one that combines the two? Click Here to Buy. Dinosoar Joggers. Click Here to Buy. Ride On Tiger. Click Here to Buy.